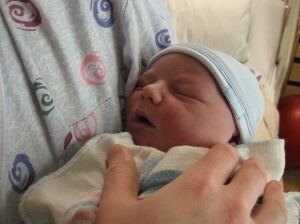 I couldn’t believe my ears when they announced his weight…9 pounds 13 ounces!! I had birthed a nearly 10 pound baby naturally! The next thing I thought was, “oh no…what’s the damage to my perineum!” I looked at Roberta as she was examining me and she informed me that I did not need stitches…I only had a minor laceration that would heal on its own. Incredible. I was relieved, to say the least. Everett was doing fine, so they finally handed him to me all wrapped up. I wanted skin-to-skin contact to I tried to unwrap him and while that was going on, I delivered the placenta. It was finally over! 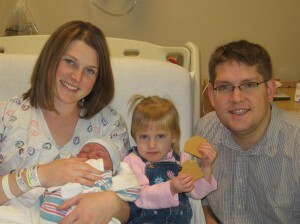 They wanted me to nurse Everett right away because his blood sugar levels were low. I finally got him unwrapped and on my chest and was even able to get him to nurse a bit. This is when everything went downhill. The cramping started as he was nursing, and as soon as he was done my nurse came to push on my uterus. Out gushed lots of fun stuff and she kept pushing and pushing to get it all out. I was in so much pain and begging her to stop, but she couldn’t! After the gushing stopped, she took it all and weighed it, and I had lost about 350ccs of fluid & clots. I guess this is a lot because they were a little worried about me after that & gave me a shot to help the uterus contract. Well, as you can imagine, that started 2 hours of excruciating pain. 4 ibuprofen, 2 percocet, and 1 shot of demorol later, I could finally relax and feed Everett again. I am being completely honest when I say that was the most painful thing I had ever experienced…way worse than labor…and I actually asked Nathan if they could knock me out! My blood pressure shot up during the pain and they were worried that I might be having post-partum pre-eclampsia (toxemia) which is rare but does happen from time to time. Luckily, as soon as the pain went down, so did my blood pressure. Finally, around 3 or so in the afternoon, Everett and I were doing well enough to be moved to our recovery room. I was able to get up and go to the bathroom, and felt so much better in the recovery bed. They kept the pain meds coming and I wasn’t in too much pain after that. My recovery has actually been faster since then…my bleeding is lighter, sitting down isn’t painful at all, and I’m looking forward to a fast recovery. This birth was a bit more traumatic than Kaisa’s (mostly because of the meconium issues & the post-partum pain) but I still feel that it went extremely well and that my choice to birth Everett naturally paid off. 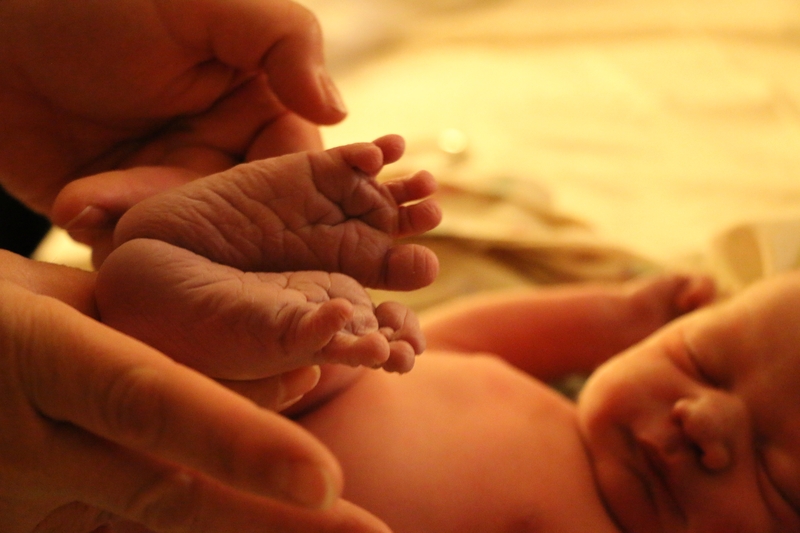 I have a feeling that if I’d had an epidural, the pushing would have been completely ineffective and I would have been whisked off for a c-section at the first signs of fetal distress. 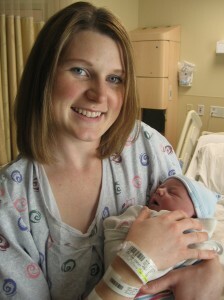 Thanks again to the Hypnobirthing method for another wonderful birth! Thank you so much for sharing! I’m so glad that I have a great natural birth expert to talk to. Too bad you don’t live here and can’t guide me. I just want a calm birth. What were the annoying questions that nurses ask? How did you have fetal heart monitoring? How did you keep the nurses/doctors from intervening when you didn’t want them? I’m going to have to call you so you don’t always have a hundred questions to answer when I read your blog. Congratulations!